I have been looking for a skincare regime that works for me for ages. I have got numerous moisturisers. I've tried cleansers and toners and none have seemed to give me the result I'm after. I aim to get a a glowing skin that is blemish free and I was finding that nothing was really giving me the results I was after and I also seemed to be getting spots left right and centre as well as my skin looking and feeling dull and unhappy. So I decided to book my mum and I into a Clinique consultation. We sat down and I was asked how I felt about my skin and what I'd like it to be like and after this the lovely lady at the counter went away and picked what products she thought would be best for me. Honestly, when she came back with the anti-blemish collection I thought this wasn't right at all. I didn't think I needed the blemish collection (I'm so naive to skincare I didn't think it entailed the spots I was getting) how embarrassing to admit. Nonetheless I let her show me what it did. We started with the foam wash as although I had no make up or anything on my skin she said it would just help calm the skin, open pores and take away any left over oil and things. Then we moved onto step 2 the clarifying lotion. This gently exfoliates the skin and takes away dead skin cells and anything left on the skin. When this step was done to me I was horrified to see that foundation was coming off onto the cotton pad and I hadn't worn any for a couple of days, she explained that exfoliating was so important because using make up removers although they do what they say on the bottle they don't exfoliate the skin, so usually no matter how much you scrub you will still have remains of make up on the skin without exfoliating. Lastly was the blemish gel which was just applied to the areas that needed the most attention, when the second and third step was applied each time it tingled which is my favourite because I can always tell something is working when it tingles. 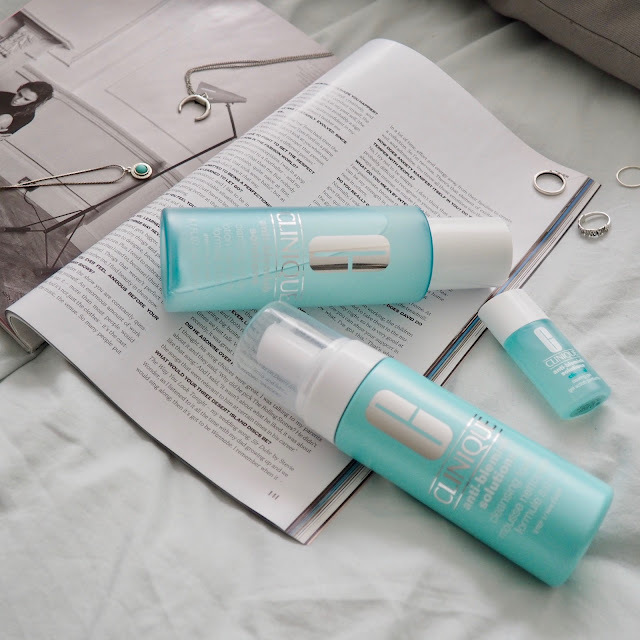 It was such a lovely experience and since applying these three steps to my regime day and night the results really have made a massive difference to my skin. It's removed spot scars I have, it rids me of the spots really quickly, my skin looks clearer and it even has that glow I wanted. Also as well as using an eye cream I feel its changed the dark circles around my eyes. I am amazed, I've never had something with such good results and these will be products I know I will repurchase again and again. Do you have any clinique products you like? How interesting!! I love Clinique!! Thanks for sharing! !